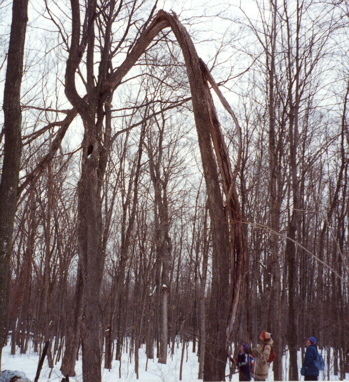 Right from my introduction to the Bridlewood Impact Study Area in January 1989, the tall White Ash tree, (Fraxinus americana), deeply split by a stroke of lightning perhaps 30 years earlier, had captured my attention. On any walk through those woods I would make sur e to pass by it to monitor the old wound, which so intriguingly opened and closed in the wind like an accordion. Thus it was a natural choice for my study tree beginning in the fall of 1991. 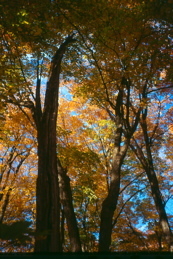 By this time the top of the tree had buckled and twisted and lay cradled in the supporting boughs of its Sugar Maple neighbor. The two crowns were so intertwined that, from the ground it was difficult to distinguish between the green and brown ash leaves and the brown and gold maple leaves. The next year the top which had been resting in maple boughs broke and dangled down. 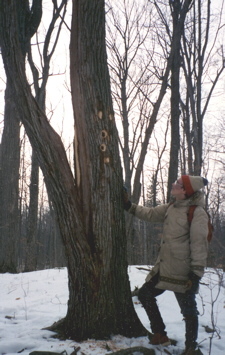 Just before Christmas we discovered a Pileated Woodpecker had been there to check out the tree’s menu and by spring there were seven of the telltale oblong holes. When finally the top of the ash tree fell to the ground, it was a happy surprise to find it a natural teeter totter. 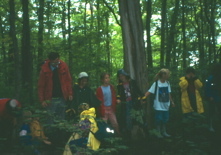 On a rainy September day in 1997 the group is shown lined up carefully balanced on the log. All photos donated or provided by members and leaders, past and present. Created October, 2004. Coding revised in June, 2016.